A woman fighter dubbed the 'Kurdish Angelina Jolie' for her resemblance to the Hollywood superstar has died fighting ISIS, it has been claimed. 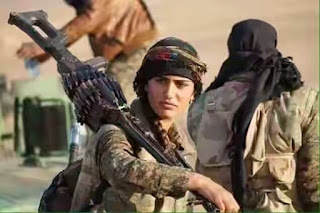 Asia Ramazan Antar was among the ranks of the all-female Women's Protection Units - a Kurdish group battling ISIS near Syria's border with Turkey. But reports have emerged that the 22-year-old brunette has been killed in a fierce clash with the terror network in northern Syria. She is said to have been involved in a number of key battles with ISIS in northern Syria before she was killed.